My father gave me a subscription to a gardening magazine for Christmas. Even better, this magazine includes recipes and a crossword. And it's weekly. So I am never out of gardening tricks to learn (I am still waiting for the thaw to be able to put any of these to use), crosswords to spend my mornings with, or recipes. 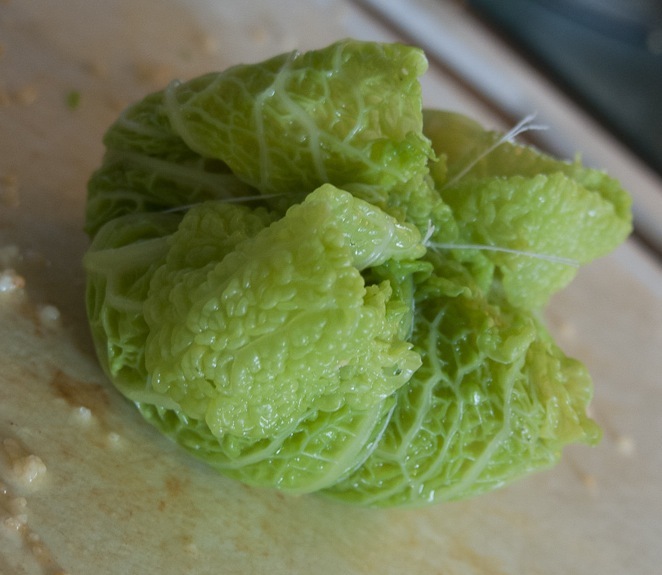 This one requires a fair number of steps--blanching both carrots and cabbage leaves, cooking semolina, sautéeing, mixing, and then forming little cabbage hobo bags (this is what "balluchon" means). I recommend an extra pair of hands for the last step, but I'm sure more dexterous people will be able to handle it alone. Plan on taking at least an hour to make this. It depends how much multitasking you want to do. 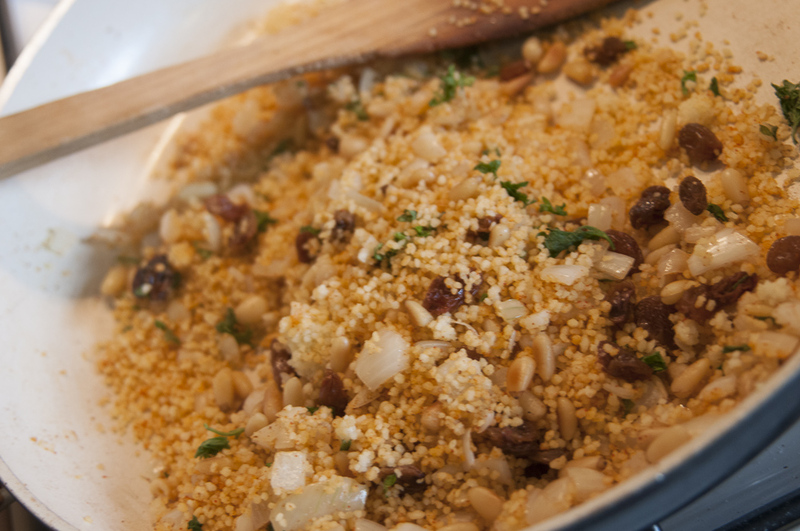 It's definitely worth the time, though--I'm a huge fan of semolina, spices, and raisins, and I've been adding pine nuts to a variety of recipes over the past year, but they could be left out if you don't want to splurge. Without that addition, it's a pretty low-cost meal, and quite filling. Soak raisins in water for 15 min to plump them up. While they soak, make up the semoule by whisking 1 tbsp of olive oil into the dry grains, then barely covering with boiling water. Let sit. Cut carrots into slices and blanche in boiling water for 2 minutes. Then blanche the cabbage leaves for 5 minutes. is transparent, add the semolina, raisins, parsley, pine nuts, and spices. Cook for about 3-5 min. Take 2 cabbage leaves and place them so that the leaf spines are perpendicular. Spoon on about 1/3 cup of the semolina mixture. Close up the leaves and tie with string (if you can do it like a package and wrap the string around twice, on all 4 sides, do that, or just uses 2 strings to secure). Repeat until you have used all 12 cabbage leaves. 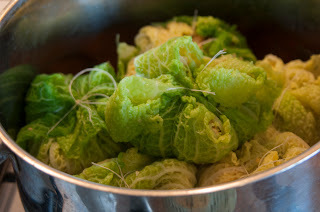 Place the blanched carrots in the bottom of a large pot, then place the cabbage "bags" on top. Sprinkle with sage leaves, salt, and pepper. Pour bouillion liquid over the whole. Cook on low heat for 30 minutes. Wow. I haven't posted here in forever. I'm going to go ahead and lay the blame squarely at the foot of the twin doors marked "moving" and "graduate school," even though the truth of the matter is that I haven't posted regularly for quite some time even before moving and beginning classes. Still, I'm here now, and glad to have a blog dedicated to my culinary adventures and misadventures; the great occasion I'm titling the Prickly Pear Picking and Processing (technically, 'canning') Scheme certainly falls into both of those categories. Equally. I decided last week that the only way for me to become a real Tucsonite was to make some regional delicacy. I'm not an expert on Sonoran (aka "Southwestern") culture, but some of my fellow graduate students and teachers-of-freshman-English started a conversation about prickly pear jam that piqued my interest. I did a little googling, picked up some supplies from (the nation's most shady) Wal*Mart, and set out not just on my first prickly pear adventure, but my first adventure in canning--period. Perhaps I should have done some more research, but I don't learn very well by example. I have to make my own mistakes, especially in the kitchen. But let's be honest here: a painful experience is a memorable experience, and far more interesting to read and write about than, say, an evening stroll on the beach. Of course, I'm not really a fan of the beach. Too much sand, and too many people who should wear more clothes. I went out on Labor Day, a Monday, so there was little enough traffic. Oh, and a tip: the best places to find mature prickly pear plants that are unattended, well-hidden-from-the-general-public, and easily accessible happen to be church parking lots. Brand me for a hypocrite, but I spotted several beautiful plants on a Sunday and decided to go back for them on a Monday. I happen to think it was a good decision. By the time I'd picked a bucketful of tunas, it was still fairly early in the morning. For those of you who want to replicate the experience, go early in the morning in August--the temperatures are bearable, and you're not competing with bicyclists and their judgmental eyes. Also, use barbecue tongs to pick the fruit, wear thick rubber gloves, and if you put the ripe tunas in plastic grocery bags, throw them away afterward. They'll be thick with glochids, as will your clothes, your hair, and every exposed inch of skin. I'm fairly convinced that glochids can drift on a light breeze here in Tucson. As you can see in the picture below, even after washing the tunas, they still have little barbed suckers to give away (see my ring finger for proof). I was stupid. Keep the darn gloves on until after you've blended and strained your loot. Don't do this. Wear gloves. Use tongs. Do this. Rinse, using tongs. Handy. I'm not going to lie--this is a messy process, and slow. 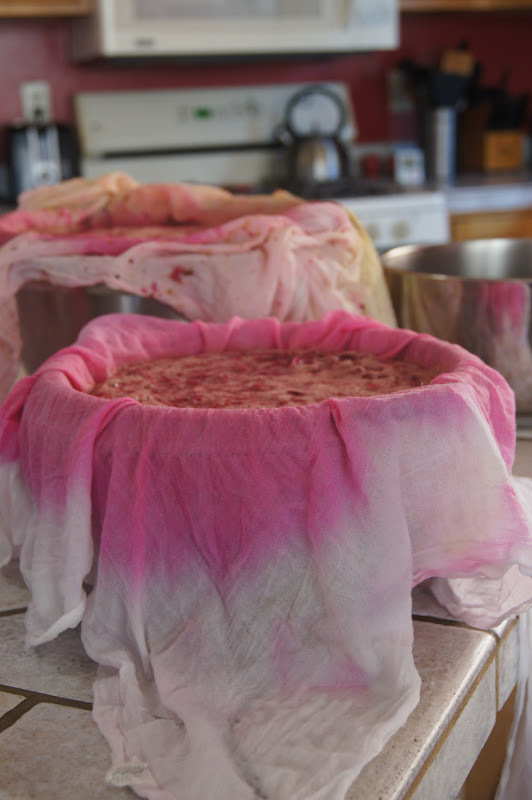 I sped things up a bit by folding up the corners of my cheesecloths to make sacks, then twisting (much as you might do with a damp towel, to wring out the water) slowly and persistently until all of the liquid was forced out. You get a lot of juice by doing it my way--more than you would by either of the other two methods, since every ounce of liquid and flavor is extracted. The pulp is good for nothing except the birds, so it went straight back to nature. It's kinda pretty, though, in an inedible way. Once I had all of my pulp strained out, I threw my prickly pear juice into a set of rubbermaid containers and refrigerated them overnight. Supposedly, the juice can go bad fairly quickly (as far as juices go), but I didn't finish my final batch until almost a week after processing the tunas, so there's apparently some leeway. An advantage to the refrigeration scheme, apart from opening up your schedule a bit, is that any leftover pulp, glochids and all, settles to the bottom. If you decant off of the top of your storage container, you shouldn't ever have to discover what it feels like to eat tiny barbed hairs. The second major part of making prickly pear jam is, somewhat obviously, the part where you get it from being a juice to being a gelled substance in a jar. For this part of the process, you need a lot of glass jars, a number of large and deep pots, lots of water, sugar, and pectin, and any herbs or spices you want to use to flavor your jam. Jelly. Breakfast spread. Sterilization is a big deal in canning. I discovered this, via Google. Unless you want to refrigerate your entire batch of jam/jelly for six or more months, you must sterilize. This involves boiling your jars, which takes quite a while to get into full swing (you want a full rolling boil, not just a piddling simmer). I put my jars on the stove over heat about 10 or 15 minutes before I started the juice, and it seemed to even out pretty well. The jar lids and rims have to be sterilized, too, but they shouldn't be boiled for a long period or they'll lose their ability to seal. Thus, boil water separately and pour it over your jars and lids. Once you have your jars started, it's time to throw your juice over the stove. The first batch I made, I used equal parts juice and sugar--five cups each--but it turned out a bit sweet for my taste, so in later batches I reduced my juice-sugar ratio to 5 : 4. I threw in a fingerful of lavender as my flavoring for my first batch, half a tablespoon of butter to reduce foaming, and about an eighth of a cup of lime juice. In later batches, I stuck with the lime juice and butter but added rosemary and lemon thyme instead of the lavender, to try something different. Both flavors couple very nicely with the prickly pear's natural flavor. Once the juice comes to a full boil, you're supposed to add the pectin, bring it back to a boil, add the sugar, and bring it back to a boil again. I mixed up the order of service, adding the sugar first and the pectin second--and it took forever to gel. I'm talking 20+ minutes here. My second batch turned out to be an even more disastrous misadventure. The first batch was at least edible--and it even turns into a somewhat normal jelly consistency after refrigeration, as I later discovered--but the second batch was terrible. I must have boiled it for too long, or something (which is odd, given that I boiled it for about a quarter of the time of the first batch, albeit at a higher temperature--as per the instructions on the packet, which I actually read). Do not wait to jar your prickly pear jam until it is visibly thick on the spoon. It will, as I discovered, turn into rock-hard candy in the jar. If it turns to candy in a jar, it has to go in the trash. Breaking a glass jar to get at your candy, while tempting, is not a good recipe for a happy intestinal system. --but go for the powdered stuff. It's cheaper, anyway. At least, it's cheaper when you consider you're getting 22 reliable 8-ounce jars instead of 12 unreliable ones--8 that didn't gel enough, and 4 that gelled a little too well. Anyway--rant = over. With my new friend, RealFruit Pectin (from Target, where the jars are also better quality than at Wal*Mart--okay, okay, I'll shut up about products now--so long as you remember, POWDER not LIQUID! ), I undertook my third and final batch of jelly/jam. If you want to be a good newcanner, then I suggest you follow the regular order of things--boil your juices (prickly pear and lime) and your flavorings first, then add your pectin and a little salt and bring it back to a boil, then add your sugar and boil for 1-3 minutes. With the powdered pectin, the sugar is noticeably harder to dissolve--you might have to mash it against the side of your pot a little to break up clumps. I didn't notice much gelling in the actual pot, but by the time I was halfway through ladling the hot stuff into my sterilized jars, I noticed it was getting thicker. Even if you don't trust yourself, trust the wisdom of the pectin container's instructions. Now, the water bath. This was the scariest part of the whole canning process for me, since so many steps had to be performed just-so. The lids, rims, and threads on your jars have to be wiped clean, tightened as much as possible, and then the whole thing immersed in boiling water for a specific amount of time. You're supposed to be able to cover them with an inch or two of water, but I didn't have any pots deep enough--and deep pots are expensive! (I checked.) Thus, I only had between a quarter to half an inch of water over the tops of my jars--but the sealing still worked, so I guess I'm okay. I sat there and watched them boil for ten minutes, with water hissing over the side of the pot (keeping a lid on is also necessary). Sometimes so much water boiled over that it extinguished the gas stove. I don't recommend canning unless you have a deeper pot than I did. A final note on pectin. Try and guess which of the jars below was made using powdered, and which with liquid, pectin. Go on. I dare you. - 10 jars of rosemary and lemon thyme-flavored jelly/jam from my third batch that turned out exactly as I'd originally wanted. That's a lot of jars. A side note: there are a lot of other things you can do with prickly pear juice. There are a lot of benefits to drinking prickly pear, supposedly, unless you're diabetic. Something about the juice can mess with your insulin, I hear. I made some limeade with my leftovers, and froze a bunch into ice cubes for future use. At a housewarming party this last weekend, one of my fellow graduate students/teachers showed all of her guests how to make margaritas with the juice, too. I tried a sip, and it was decent. I'd be more interested, though, in figuring out how to make prickly-pear-flavored sherbet or ice cream. Can you imagine the scrumptuousness? Julia Childs would roll over in her grave. .... I got into GRAD SCHOOL! So basically, life has suddenly become very strange here. I have still been cooking and pondering foodie things, but (and there's always a 'but' with me) my mental faculties have been hijacked by all of the projects I need to finish and all of the loose ends I need to tie up before I leave Arkansas. A second note of good news is, the lovely city of Tucson has both a Sprouts and a Trader Joe's, so you can count on some serious foodie nerd-out moments in the future. I'll keep ya'all posted as things develop in that direction. And ... enjoy. This sauce is a little tart, and abundantly creamy. You will not regret making it, I assure you. I love casseroles. Take the simplest, humblest ingredients--leftovers, even!--and throw them in a baking dish with cheese and some cream, and you're set! I call this the Law of Excellent Dinners, wherein the prime tenets are simplicity, cheesiness, and toothy delight. Heat oven to 350 degrees Fahrenheit. Grease a 9" by 9" glass baking dish with butter or cooking spray. Cook rice as directed on package(s), using 2 tablespoons of the butter and a pinch of salt. Meanwhile, in an extra-large skillet, melt the remaining 1/4 cup of your butter over medium-high heat. Cook mushrooms, onion, and garlic in butter and white wine for 5 minutes, stirring occasionally, until the bellas are tender and the onions are translucent. Reduce the heat to medium and stir in cornstarch. Gradually add milk and heat to boiling; cook for 5 minutes, stirring constantly, until the mixture thickens. Remove from heat and stir in half of the cheese. 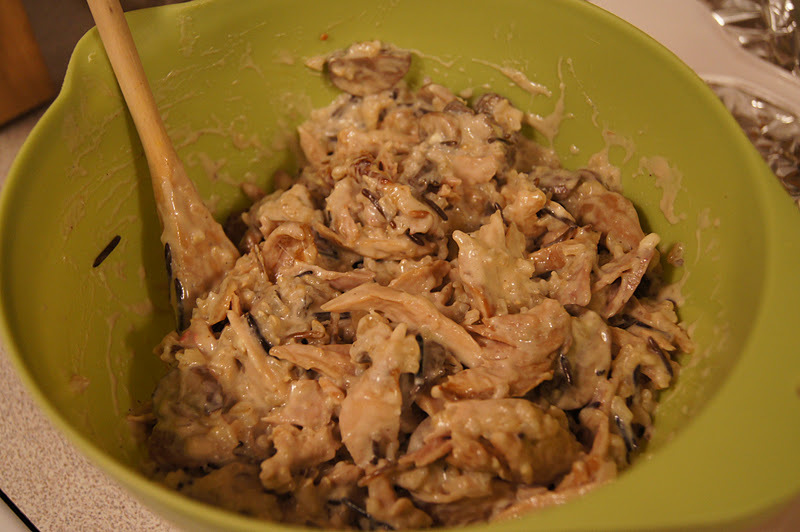 In a large bowl, mix your cooked rice, milk mixture, chicken, broth, and seasonings until blended. 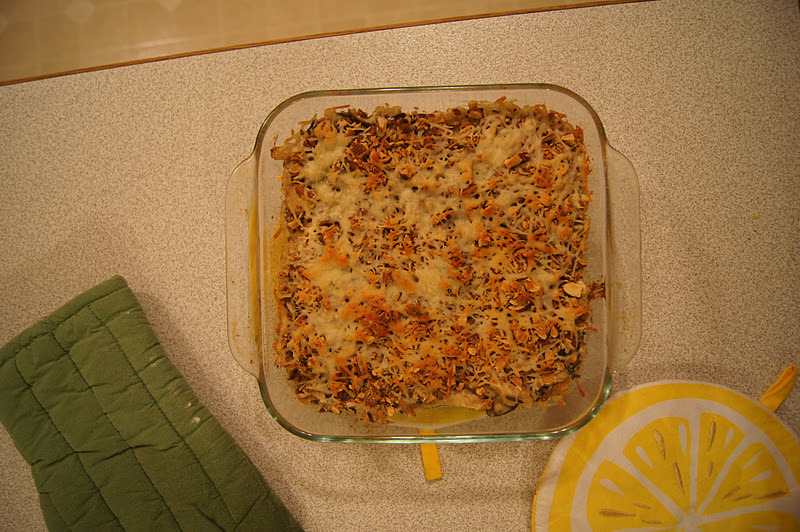 Scrape into baking dish with a spatula and sprinkle with almonds and remaining cheese. 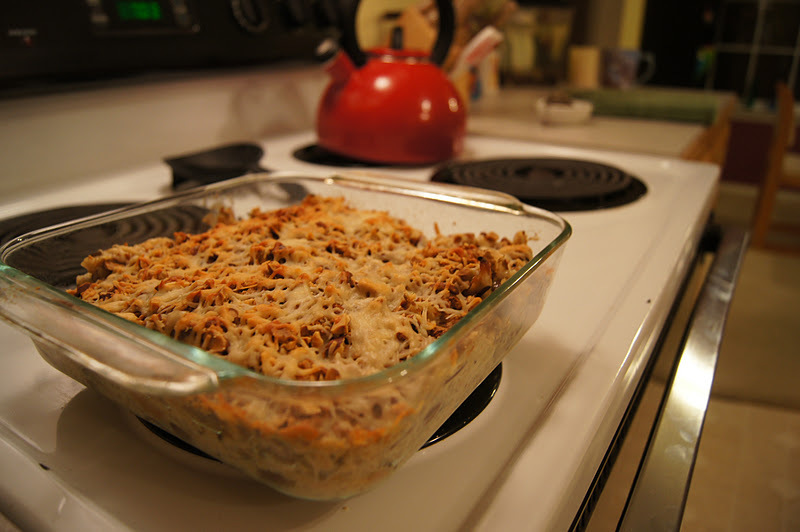 Bake uncovered for 20 to 25 minutes, or until thoroughly heated and cheese is melted. VERDICT? This dish is so, so good. It is complex. It is rich. It has cheese, chicken, bella mushrooms, and wild rice. Can I hear three cheers for texture? Amen. 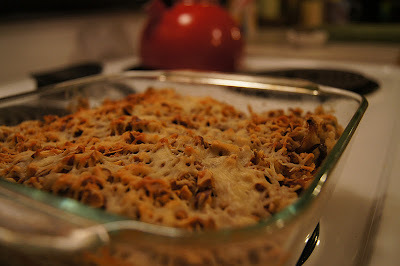 * For this recipe, I used the leftover chicken from my honey & molasses-glazed chicken, which added a pleasant rich sweetness to the already complex pastiche of flavors in this casserole. I have decided that I have a bad penchant for taking the path of least resistance when it comes to food. That is, I tend to gravitate toward the cheap carbs, like the Ezekiel bread you can find at Harps or the great range of sprouted-grain breads, bagels, pastas, tortillas, and pocket breads that are available at Ozark Natural (my go-to place for whole, bulk, and healthy foods now). These carbs are not bad in the big scheme of things--but they're still pretty worthless if they're your primary food group. And so, because I like meat the same way that women like classy gentlemen, I decided I would try to introduce a little more protein into my diet. (Protein is not to be confused with peanut butter, a divine substance which I believe stands as a food group in and of itself.) Hence, I shopped the weekly special at Aldi and picked up a pack of drumsticks, simply because I've never cooked drumsticks before and they're a relatively inexpensive cut of meat, especially at Harps on a Wednesday evening. Whisk together the water, honey, balsamic, Dijon, molasses, and garlic. 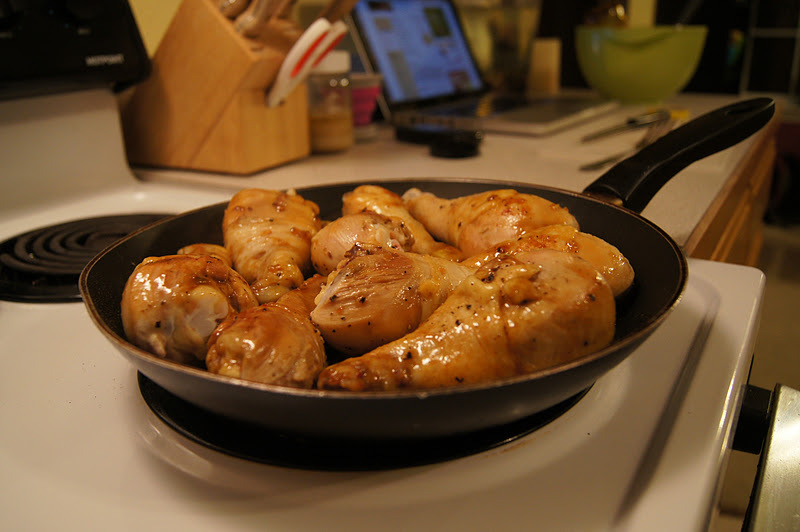 Heat the olive oil in a large nonstick skillet over medium-high heat, and season the chicken with the salt and pepper. Once the pan is sizzling hot, add chicken and brown on all sides. 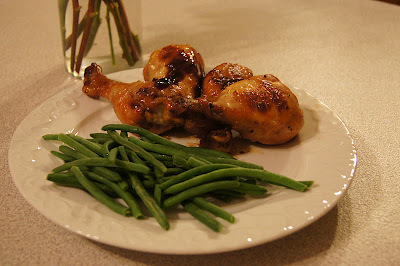 Pour the honey & molasses mixture over the browned chicken, turning the drumsticks to coat. Reduce the heat to medium-low, and cover and cook the drumsticks for 15 minutes or until done, turning the chicken every 5 minutes. Uncover and cook for an additional minute or until the honey-molasses mixture is thick and rich in color. Remove from heat and cool 10 minutes before eating. Cover and chill your leftovers--they make an excellent base for something like my chicken and wild rice casserole. VERDICT? I rather enjoyed this one. I haven't made a sweet chicken recipe before, and it made a refreshing change from the dry and bland overcooked chicken that is so common in this area. The meat practically flaked off of the bone, and even though it was sticky and messy it was a delight to eat. Best of all, it violates none of the laws of the Body Chemistry Diet, and it's safe to eat for anyone with a gluten intolerance, as well. Extra points! I'm really lucky to live in relative proximity to a whole foods store (that is, around 45 minutes away). We have this lovely big whole foods grocery out this direction that stocks a wide variety of fresh-baked sprouted grain breads, and they also carry a few other sprouted grain options (pasta, tortillas, and the like). Last time I was there, I found these lovely sprouted-grain softbreads that are somewhere between naan and pita, but open up in the middle to allow for all sorts of options. I adapted this recipe from a much more bold variant I found online (it went in for tomatoes and suchlike), but I made some significant changes. I wanted the dill and the lime to speak loudest, making a cool and slightly sharp contrast to the salmon. I cut back on the oil and I switched out yogurt for mayonnaise like I always do, and the end result tastes about as healthy as pan-fried foods can. To make the dill aioli, mix the yogurt, lime zest, 2 teaspoons lime juice, chopped dill, and garlic together. Keep this refrigerated while you prepare the rest of the meal. Heat oil in saucepan to medium (or just slightly under) heat. Cut salmon filets into strips and place in a bowl. Sprinkle cumin and your remaining 3 teaspoons of lime juice over fish. In a separate bowl, mix your egg and icewater with your cornstarch to make a kind of tempura. Dredge the fish strips in the batter and then in the crumbled oats (you could use Panko here if you prefer, but the oats complement the salmon perfectly). Roll the fish in the oats to make sure your strips are completely coated. Fry fish in the preheated oil a few pieces at a time, making sure to give them enough room, for 4-5 minutes or until golden brown on all sides. Place fried fish strips on paper towel to drain. Once your fish are finished cooking, drain all but a little oil and use the remainder to caramelize your onions. To assemble the final product, slice your softbreads in half and fill with fish strips, topping with avacado, caramelized onion, and your dill aioli sauce. VERDICT: I really, really enjoyed this meal. It was a bit fiddly to make, sure, but it didn't take overly long and the final product was absolutely scrumptuous. I love finding new uses for salmon, and this one was excellent! One day last week, I found myself making dinner for a friend. Such an event usually means I pull out all the stops and go gangbusters with exotic ingredients. That day, though, I had next to nothing in the pantry and fridge to satisfy a visitor. I had to think creatively, and quickly, in order to keep her happy (she's a picky eater!). So, I decided to make meatloaf for the first time in my life. At this point, you're probably questioning the wisdom of making something for the first time while entertaining a picky eater. Well, now I am too. Apparently, said friend is not only a picky eater but doesn't particularly like meatloaf. So! The moral of this story is: always keep something fancy on hand. Even the best meatloaf won't keep everyone happy. For this recipe, I drew from the fantastic cooking resource, How to Cook Everything. I have certainly put it to good use since my sister gave it to me a year ago! I recommend choosing a fattier blend of meats than I used--mine turned out well, but the fattier the ground meat, the richer the final product. Meatloaf with bacon on top isn't exactly calorie-free in the first place. Heat your oven to 350 degrees Fahrenheit. Meanwhile, soak the bread crumbs in the milk until the milk is absorbed (about 5 minutes). Mix together all the ingredients except for the bacon. Shape the meat into a rounded loaf on a baking pan, then lay the bacon across the top and tuck underneath. The bacon should help hold the loaf together. Bake 45 to 60 minutes, basting occasionally with the pan juices or barbecue sauce (supposing you can find some without high fructose corn syrup in it). When fully cooked, the meat loaf ought to be lightly browned and firm to the touch. If you have an instant-read thermometer (I do not), it should read 160 degrees Fahrenheit when inserted into the center of the loaf. The bacon should be nice and crispy--if you find it hasn't become so by the time the meatloaf is fully cooked, you can run the whole loaf under the broiler for 2-3 minutes and it will crisp right up. VERDICT: Pretty great, really, unless you don't like meat loaf in the first place!